Welcome to Dare to Get Dirty 2013!! 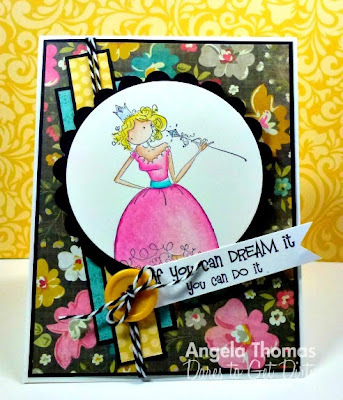 I made this card for my challenge that I'm hosting for Dare to Get dirty at Splitcoaststampers!!! We love our Fan Club members, and the Dirty Girls can't wait to show you everything we have in store for you this week! Want to play along with our 42 Dare to Get Dirty challenges and win prizes from our Member Companies? Learn more here. For my card, I've used two Stamping Bella sets, Faith the Fairy and Jane Girl. The image was stamped with Archival Black ink and then colored with Prismacolor Pencils and Gamsol. Diamond Stickles were added to her wand and crown. Hope you like it!! Make sure you join us for the Dare to Get Dirty Challenges!!! You should link this up at my Just Because Linky Party!